Que Rico Tapas and Cambridge Wine Merchants have designed a cocktail and tapas menu for one special night as part of Eat Cambridge 2018. This special event is held at Cambridge Wine Merchants Cherry Hinton Rd, Saturday 25th of May, at 7 pm. We have chosen four refreshing cocktails, with summer flavours and a Spanish hint. Each cocktail is paired with a tapa, which has been customized for each cocktail too. Yes, we worked hard at the backstage! The menu for 4 cocktails and 4 tapas is £42.60 (and will serve a welcome drink and a chocolate that will surprise you too!). You can book your tickets at Eventbrite. Rebujito, from the sunny and hot Andalusia, the best way to refresh the warm summer days. It is made with the best drink you can have there, sherry! La Paloma, from Mexico. Who can know more about refreshing drinks than Mexicans? It is a refreshing grapefruit and tequila-based cocktail. Red vermouth cocktail. A modernized version of the traditional Spanish vermouth, with a hint of gin and orange. Grasshopper, minty, creamy, perfect for after dinner. And with a fresh and beautiful colour! 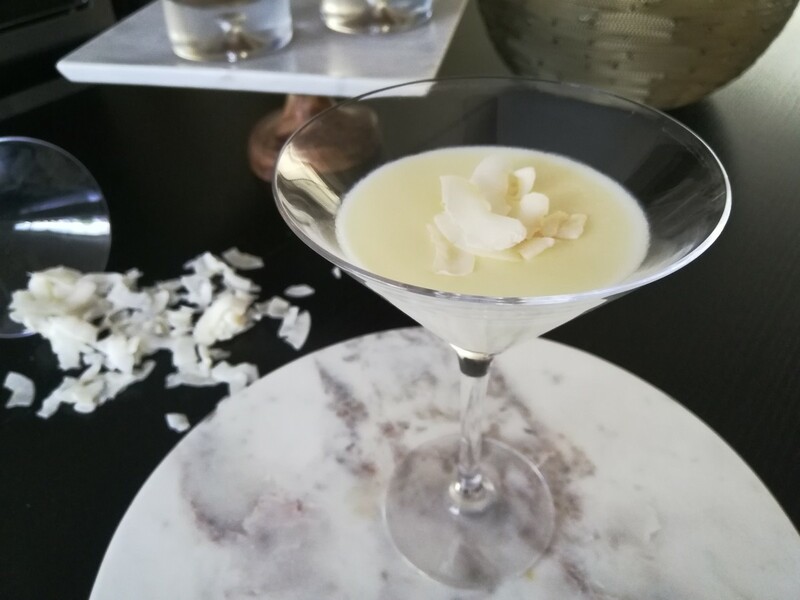 Coconut Mousse, sweet, creamy and a perfect end to balance the mint flavour of the grasshopper. We are really excited about this event and hope you join us! It will be a fun and informative night, learning about cocktails and pairing with food. Follow us on social media as we will give more information about the menu. Don’t forget to tell us if you prefer a vegetarian menu. Due to nature of this event, we can only accommodate allergy requirements if you inform us in advance. We will try to do our best.